The monthly average price chart for both metals from January 1970 to December 2018 is shown below. Note that gold was fixed with a range from $35 to $37/oz until December 1971 while palladium was fixed at $35 to $36 until May 1972. We use London pm closing prices compiled from Kitco.com. 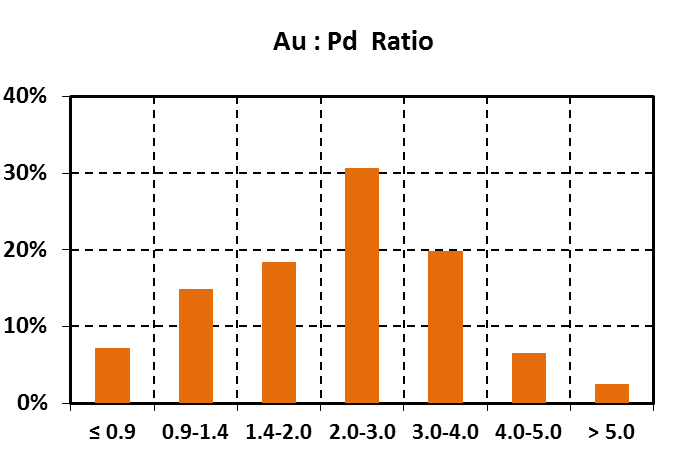 As a result, gold to palladium price ratios show wide variance over the 49 years of this study and range from highs above 6.0 to lows well below 1.0. The average and the mean are both 2.4. ·Ratios < 0.9 are unusual, occurred over 7.1 % of the time, and happened from 1999 to 2002. ·Ratios from 0.9 to 1.4 constitute 14.8 % of the record and occurred from 1970-1974, in the late 1990s, early 2000s, and late 2017 thru 2018. ·The ratios between 1.4 and 2.0 happened 18.4 % of the time. ·Ratios from 2.0 to 3.0 comprised 30.4 % of the distribution. ·3.0-4.0 is also a common range for ratios and occurred during one-fifth of the record at 19.7 %. ·The 4.0-5.0 interval is unusual, covers 6.5 % of the months in our compendium, and happened in 1981-1982, the market crash of late 1987, 1990-1992, and the economic crisis of late 2008 to mid-2009. ·There are 14 monthly outliers at >5.0 that comprised 2.4 % of the total record. 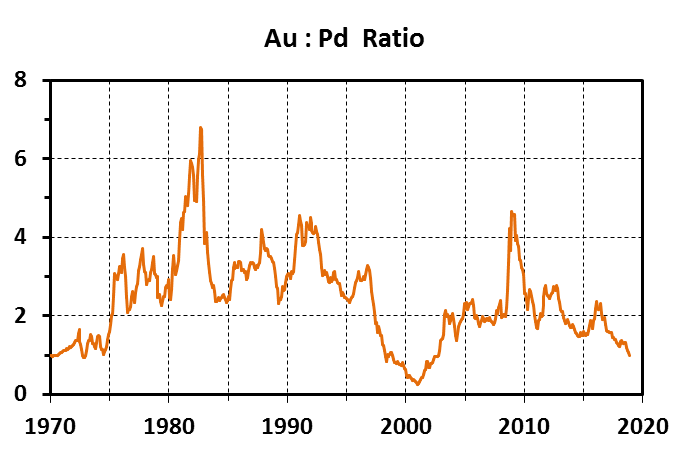 These abnormally high ratios happened in 1981 and 1982 when palladium fell well below $100 an ounce. ·From early 1999 thru mid-2002, ratios were less than 0.90 when Russia cut back sales from its palladium stockpile to the West. In January 2001, rumors spread that it would stop exports altogether, palladium soared to record highs over $1000 an ounce, and the ratio bottomed at an historic low of 0.25. Unhedged hoarding by American automaker Ford exacerbated the price spike. But when Russia’s balance of payments suffered, it dumped palladium on the open market in mid-2001, and the price went parabolic. Note that Ford wrote off over $1 billion against its hoard at the end of that year. 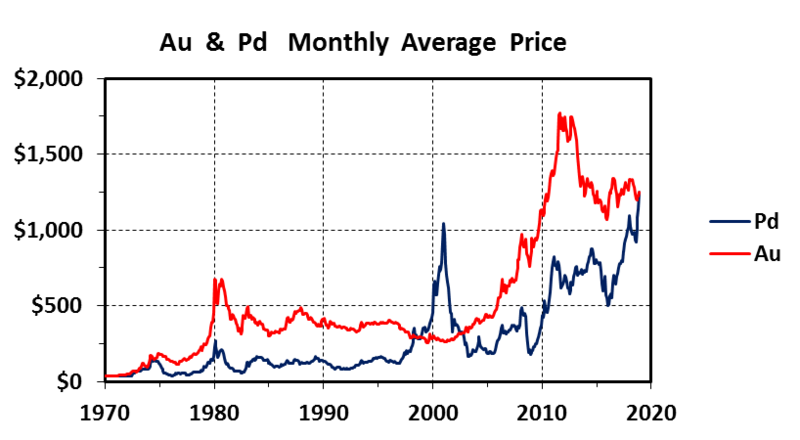 ·Ratios on the extremely high side (> 5.0) occurred when palladium was below $100 and as low as $57 an ounce in 1981-1982. A global recession resulted in lessened industrial demand. This was also prior to the widespread substitution of palladium for platinum in catalytic converters. ·Another time of high ratios (> 4.5) occurred when the auto industry collapsed during the global economic crisis in the winter of 2008-2009. While palladium demand plummeted, monthly average gold prices reached highs over $900 per ounce on safe haven demand. ·Gold is the only truly precious metal with an estimated 98 % of the cumulative amount ever mined still available for hoarding, trade, or barter. 85 % of gold is held as jewelry or bullion. Demand is driven by wealth preservation and safe haven hoarding in times of economic uncertainty and disruptive geopolitical events. ·Industrial uses of palladium constitute 94% of demand. Use is dominated by the automobile market with significant demand for electronic, dentistry, and chemical applications. About 5 % is used in jewelry with a very small investment demand at 1%. ·Gold is produced by a plethora of countries around the world from a variety of deposit types. Nine countries mine more than 100 tonnes per year. 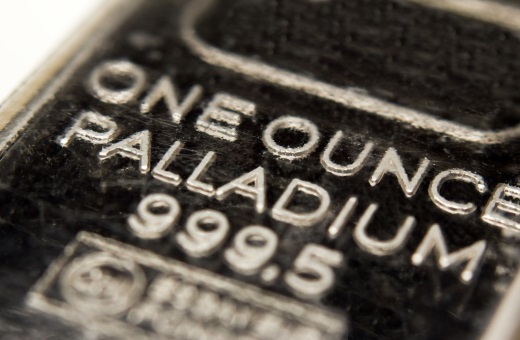 ·Palladium supply comes from five countries but is dominated by Russia and South Africa. Each produces 38-39% of the world budget with Canada at 10%, the United States at 5-6%, and Zimbabwe at 4%. It is produced as a co-product or by-product of platinum mining and is a by-product of nickel smelting. ·speculators in the small palladium paper market (bullion exchanges, ETFs, and derivative markets) exacerbate supply-demand imbalances, creating volatility and leading to overbought or oversold conditions. As my readers are aware, I view gold as the only real money. It is my safe haven and insurance policy against financial calamity. Acknowledgment: Troy McIntyre is the research assistant for MercenaryGeologist.com. I thank Louie James for an interesting discussion about palladium and monetary metals.